All data and information provided in this blog post are for informational purposes only. I make no representations as to the accuracy, completeness, currentness, suitability, or validity of any information in this blog post and will not be liable for any errors, omissions, or delays in this information or any losses, injuries, or damages arising from its display or use. All information is provided on an as-is basis. Now I am ready to blast off. To state it nicely, my water is unacceptable. Who is to blame and why hasn’t sufficient money been spent to improve a fundamental need—and a human right—which is clean and drinkable water? And sorry, but I don’t feel the government’s pain when they say they are out of money. And I blame both the Democrats and the Republicans for my brown and undrinkable water situation. Since my last blog post, I have purchased a 10-cup Zero Water filtration system which seems to work well. I have been using the filtered water for coffee and boiling but will stick to Poland Spring for drinking. I have also diligently continued my research as to why certain contaminants deemed unsafe in our drinking water remain unregulated by the EPA. And more importantly, I have been researching so see if those contaminants are lurking in my dark brown and undrinkable water. And make no mistake about it, my research results have been fairly frightening. Huh? Thank you for your assurances, water company, but if all of the above is true, please explain why my water is brown? I would like to share a recent example of people thinking their water is safe to drink based on testing and state assurances and then found out otherwise. The New York Times had an article on Tuesday, March 15, regarding tainted water in Vermont and New York. In recent weeks, several private wells in North Bennington Vermont have tested positive for the industrial chemical perfluorooctanoic acid, or PFOA. 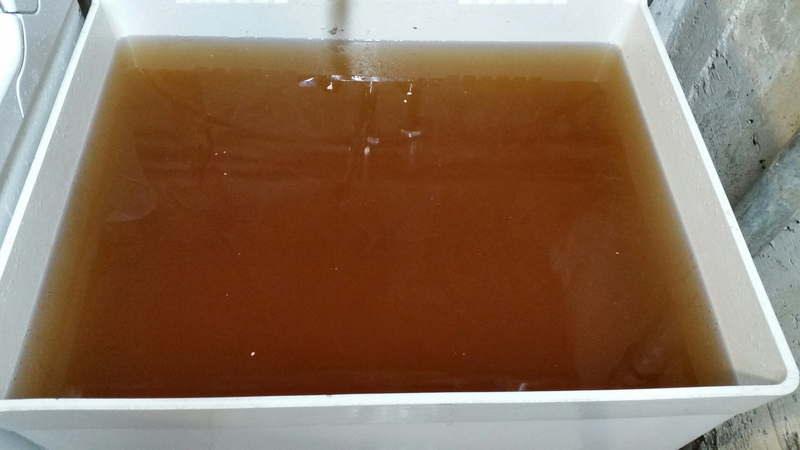 This contaminant has been linked to cancer, thyroid and heart disease, serious pregnancy complications, and birth defects, making North Bennington the latest in a growing list of American communities unsettled by a contaminated water scare. PFOA was also discovered in the public drinking water in the village of Hoosick Falls, N.Y., prompting residents to rely on bottled water amid charges that the state took far too long to respond to the problem. It was also found in public wells in Petersburgh, N.Y., the site of a plastics factory south of Hoosick Falls. Not surprising to me, the state of New York has repeatedly assured citizens of Hoosick Falls that their water was safe. And last week, as environmental officials in New York and Vermont searched for other potentially contaminated areas, officials in Merrimack, N.H., announced that PFOA had been discovered there as well. And the number of people found to be drinking water tainted by PFOA is almost certain to grow. PFOA was once used to manufacture non-stick pans, microwaveable popcorn wrappers, and Gore-Tex boots— and practically anything that is non-stick, stain-resistant or water-repellent. But the health effects PFOA causes and the way it spreads and contaminates are not well understood. And even more alarming was that when I checked out which 27 states had PFOA in their water, New York was one of them. And guess what? It turns out that my county—Nassau—via the Town of Hempstead Water District, serving 110,000 people, has PFOA in its water. Does that mean my water contains PFOA? Even though New York State was advised that there were concerning levels of PFOA present in the water going back as far as 2005, they claim that no one did anything about it because PFOA was and remains an unregulated EPA contaminant. Sounds to me like someone is trying to pass the buck. And according to scientists, even as the chemical PFOA continues to contaminate water across the country, government agencies, from local health departments to the federal EPA, have yet to grapple with the full extent of the problem, or what it will take to clean it up. It doesn’t take a scientist to tell me that the EPA needs to lower the level at which it says water containing PFOA is safe to drink. ASAP. I mean come on already. Can the EPA assure me that my water, which may or may not contain PFOA, is safe to drink? And can my water company give me the same assurance? When I had my hot water heater and pipes flushed out a couple of weeks ago, the company I used—Hot Water Plus—told me that they usually offer a 60-day clear water guarantee. Oh, but not in my neighborhood. Maybe my water company can give me some insight as to why not? 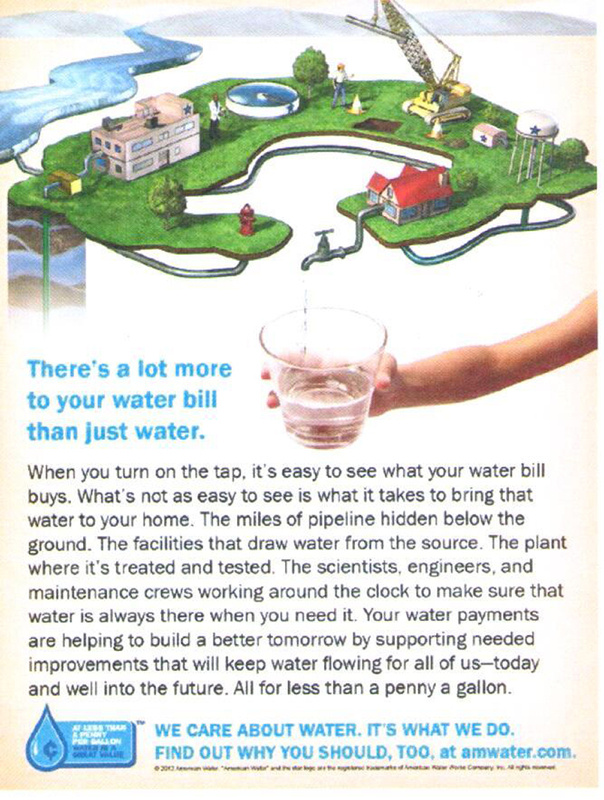 And speaking of my water company, I recently noticed a water main flushing advertisement in my local paper, letting customers know that New York American Water is preparing to flush the water mains in its distribution system to help them provide us with high-quality water service. Oh, and by the way, customers may experience discolored water. The flushing will take place Monday through Friday between 4/11 and 4/21—a whopping nine days. I can only imagine what color my water will look like after they flush. 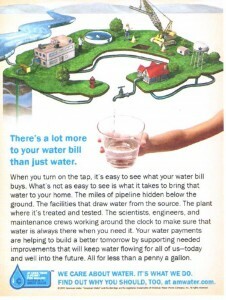 The advertisement also suggested we go to their website and view our water quality report. Except that, one needs to be a rocket scientist to read and understand it. Here is what I have to say to my water company: Based on your claims, that the water delivered to my county residents may meet all drinking water standards, but that doesn’t mean it is safe and/or drinkable. Many state officials, including New York, have suggested that the absence of strong guidelines from the EPA is at fault for the tainted water problems residents all over the country have recently uncovered. And yet many of those residents had to aggressively push their local governments to look into the situation—instead of the other way around. Our local government is responsible for managing and delivering a range of quality services to their communities, including drinkable water, correct? The American water crisis is an example of government failure, unpreparedness, intransigence, inaction, delay, denial and environmental injustice. But never underestimate the power of citizen engagement and our ability to speak out and protest against government inaction. Thankfully there are concerned Americans out there who are willing to question and challenge government leadership. And thanks also to a free press, the watchdogs who uncover the injustices and shout it out to the masses. This blog post is going to be more like a slog post, but please bear with it, because you will not believe our nation’s water situation. 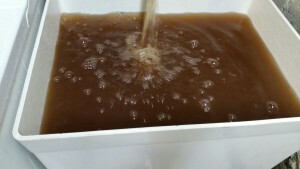 Here is the million dollar question: Do you know what’s in your tap water? As you can see from the picture of my water last week, I certainly had no clue as to what was in my tap water. And after umpteen hours and days of research, I still don’t. All data and information provided in this blog post are for informational purposes only. And since pouring through the various information on many governmental and water supplier websites, was like trying to cure cancer, I make no representations as to accuracy, completeness, currentness, suitability, or validity of any information in this blog post and will not be liable for any errors, omissions, or delays in this information or any losses, injuries, or damages arising from its display or use. All information is provided on an as-is basis. Okay, now I’m ready to start at the very beginning. Every year, the Safe Drinking Water Act (SDWA), the legal basis for regulating public drinking water, requires all water suppliers to submit an annual report to every customer on contaminants in their drinking water (EPA 2006c). But from my research, it doesn’t seem that these reports show us what’s really in our tap water. They don’t contain information on unregulated chemicals for which testing is not required by states or the Environmental Protection Agency (EPA), and they provide only average levels of most contaminants. 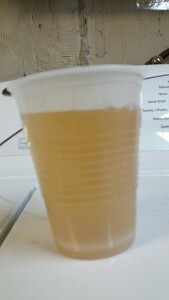 So the water companies are able to tell their customers that they are delivering clean, high-quality drinking water, an incredible accomplishment considering the subpar quality of the water in many cases, including mine. Because the federal standards that the SDWA has set, doesn’t necessarily guarantee your water is perfectly safe to drink. According to what I was able to find on the EPA.gov website, over seven hundred substances have been cataloged as potential contaminants, yet under the 1974 SDWA, there are only 90 contaminants public water systems need to worry about, report or test. Additionally, since 2004, more than half of the chemicals detected through testing can legally be present in any amount because they are not subject to health or safety regulations. More disturbing than the slim picking and choosing of contaminants—the Safe Drinking Water Act has a Contaminant Candidate List (CCL) of 100 chemicals and 12 microbial contaminants that are currently not subject to any drinking water regulations whatsoever, but are known or anticipated to occur in public water systems. This list includes pesticides, disinfection byproducts, chemicals used in commerce, pharmaceuticals, and waterborne pathogens. Say that again? At least five in five years? 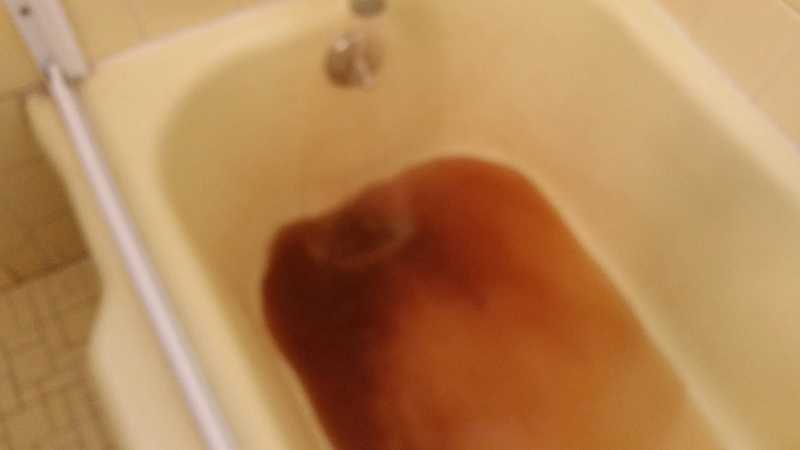 Over the years, I have taken many photos of my discolored water and even called New York American Water to complain about and report the problem. Each and every time I called I was reassured that my water was safe and the discolored and sometimes foul-smelling water was temporary, and due to the flushing out of their pipes. Except that my water would be brown or smell funky much more often than just when New York American Water flushed their system. And it wasn’t just the water. I have on many occasions been forced to throw out my ice because it looked completely fine, but the smell was so rancid that it stunk up my freezer. And the water has wreaked havoc on my toilet bowls, discoloring them with stripes of dark brown leaving me paranoid that my guests think that I don’t clean well. For those of you who know me personally, it’s no secret that I am a manic germaphobe and a neat freak. So how did this horrendous water situation sneak past me? When buying a refrigerator a few years ago, I made a point of staying away from any models with a water dispenser. After ditching my smelly refrigerator ice, I certainly wasn’t rushing to drink water from any fridge. Thanks but no thanks. And I long ago stopped drinking the tap water. But let’s be real here. I shower and brush my teeth with it, bathe in it, use it for cooking and coffee, and wash my raw fruits and vegetables in it. This water is in every pore of my body without ever having to drink a drop of it. A month or so ago, the flow of my hot water seemed compromised and I noticed that when taking a shower it was running cold very quickly. I also noticed a weird metal-like taste combined with a strong chlorine smell to the water and started to see dirt-like sediment sitting on the bottom of all of my toilet bowls. Last week, my hot water became so brown and foul smelling that I made an emergency call to a plumber who recommended that I empty out my water heater and flush my pipes—immediately. “This is what you’ve been drinking,” the plumber repeated over and over again as he emptied the filthy, sludgy water out of my cold and hot water pipes. And he was adamant that everyone should flush out their systems once a year. Who knew? When was the last time you emptied your hot water heater and flushed your pipes? I then jumped right on my hot water heater company’s website to see if they had any manufacturer’s recommendations and found absolutely nothing. Getting back to New York American’s website. There was also a section on what they are doing to improve the water. Except that, it’s dated 2013. So does that mean they haven’t updated this section for 2+ years? As we saw from Flint, a lot can happen in two years. Now I consider myself to be an intelligent and healthy minded woman. I am, however, appalled and embarrassed that I had absolutely no clue that I was supposed to flush anything but my toilets. But after witnessing the muck and gunk that oozed out of my faucets and water heater, I’m on official 12-month flushing notice. Make that a 6-month notice. Just as a reminder, take another look at my water. New York American Water scores among the highest of all water companies? The sludge and filth in my photos surely tell an entirely different story. 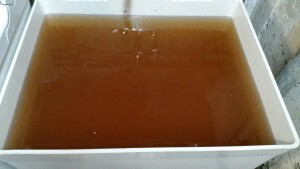 After carefully scrutinizing the New York American Water website, I kept going back to my photos and videos and couldn’t help but wonder what score the federal regulators would give the dregs that spewed out of my pipes and hot water heater. I doubt they would give it a 100. I also kept going back to Flint Michigan. For nearly two years, the residents there have been slowly poisoned by lead in their drinking water. If our federal regulators dropped the water ball there, maybe they missed something in my little hamlet. 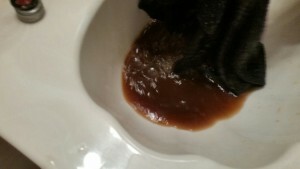 And if my photos are any indication of what my neighbors may have lurking in their pipes and hot water heaters, (according to the plumber who flushed out my system they all have what I have), I sincerely hope they are reading this blog. I continued to do my due diligence and spent days researching various sites hoping for some shred of good news. But that wasn’t in the water cards. All I found were more and more alarming tidbits. The bottom line is that sewer overflows and aging infrastructure are significant contributors to drinking water quality problems in our country. And our nation has failed to invest the funds needed to renew and replace our essential drinking water infrastructure. The result is an antiquated system that not only poses serious health and safety risks but is also prone to dangerous leaks and failures. Ten long years ago, the American Society of Civil Engineers gave American drinking water infrastructure an overall grade of D-minus. According to the study, our declining water system, including aging wastewater facilities and leaking drinking-water pipes are a threat to the nation’s prosperity. The study went on to say that time was working against our country’s infrastructure and that it would cost untold billions of dollars to replace aging facilities that are near the end of their useful lives and to comply with existing and future federal water regulations. And speaking of federal water regulations: From what I read, legal limits are established by the Safe Drinking Water Act, although a stricter health guideline for drinking water quality has been created by the World Health Organization. A least, I think it’s the WHO. It was near impossible to get a precise fix on who does what. So in many cases, your water may contain contaminants below legal limits, but above health guidelines. This part of my research was very clear. Does my water look legal and/or healthy to you? According to the Environment Working Group website, the water in my county from test data available from 2004-2008 was not as high-quality and clean as New York American Water would have me believe. There were 16 contaminants in our water. The National contaminants average is 4. And get this one: All 16 contaminants exceeded the health limit. And the dreaded Lead was one of those contaminants. Now if these contaminants exceeded the legal limit, they must be unhealthy, correct? Manganese: Exposure to high concentrations of manganese over the course of years has been associated with toxicity to the nervous system, producing a syndrome that resembles Parkinsonism. In addition, young children appear to absorb more manganese than older age groups but excrete less. This adds up to a greater potential for exposure in the very young. Since manganese’s effects on the developing nervous system have not been adequately studied, it is especially prudent for pregnant women and young children to have drinking water that is below the manganese AL. 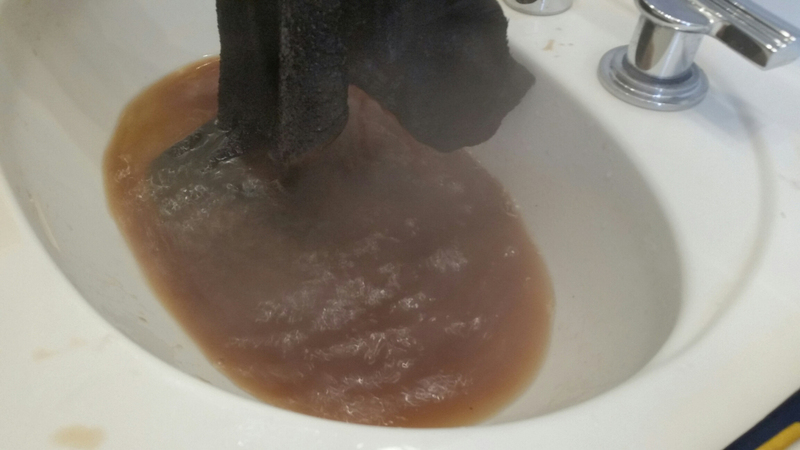 You may suspect that manganese is in your water if the water is discolored (brownish-red), causes staining of plumbing fixtures (faucets, sinks) or clothing, or has an off-taste or odor. If this is the case, you should have your water tested by a state-certified laboratory for manganese. When you get the results, you should contact your local health department to help you interpret the results. 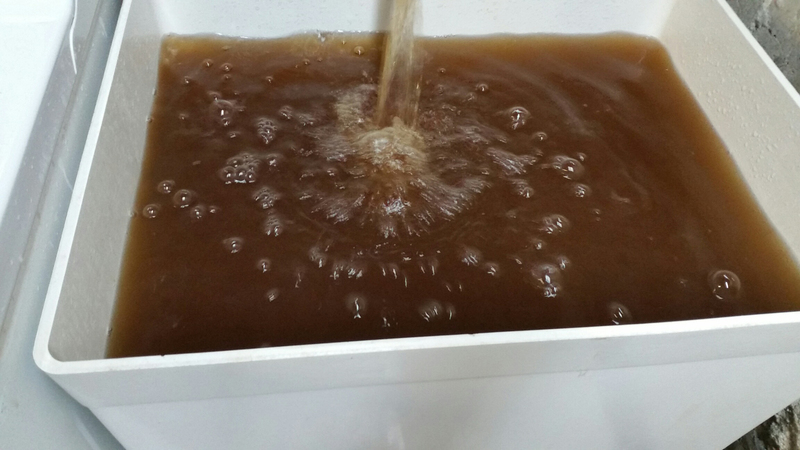 There are no enforceable federal drinking water standards for manganese. The CT Department of Public Health recently set a drinking water Action Level (AL) for manganese of 0.5 mg/l to ensure protection against manganese toxicity. This AL is consistent with the World Health Organization guidance level for manganese in drinking water. Aluminum: At high concentrations there is evidence linking aluminum to effects on the nervous system, with possible connections to several diseases, such as Parkinson’s, Alzheimer’s, and Lou Gehrig’s disease. The American Water Works Association recommends that concentrations of aluminum in drinking water should not exceed 0.05 parts per million (0.05 ppm or mg/L). The U.S. Environmental Protection Agency recommends that the level not exceed 0.2 ppm. Okay, so I’m no scientist, but according to the test data from 2004-2008, Manganese exceeded the legal limit by 50 ppb, whatever that means. And Aluminum exceeded the legal limit by 200 ppb. Can someone who knows the difference between ppm, ppb, and mg/l help me out here? There were also 13 additional contaminants found in the water, but none of them exceeded the legal or health limits. I won’t bore you with the gory details. So as far as I can tell, the above information is what’s lurking about in our Nassau County, tap water. As if this news wasn’t bad enough, I received a 2016 Spring Flushing pamphlet in the mail from New York American Water this week. It seems they will be flushing North Woodmere (my hamlet) Monday-Friday, 8am-4pm from April 11 through April 21. According to the New York American Water pamphlet, flushing their system helps to clean out any buildup of mineral deposits and sediment inside their pipes. 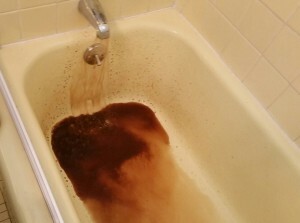 They went on to say that discolored water may occur because the sediment in the water mains gets stirred up. They assured in the pamphlet that the discolored water is not harmful and we should simply let our water run until it is clear. After writing this blog post, I am beyond pessimistic about anything I am told about my water. And when New York American Water flushes their pipes for TEN days I have to wonder what corrosion and other dangerous materials are being dislodged from their systems and flowing into mine. Sorry New York American Water, but I am not reassured. 1) Please tell me how New York American Water scores 100? Compiling national tap water information and providing full access to the public should be a requirement for the EPA. More than a decade ago, the Safe Drinking Water Act Amendments of 1996 included such a requirement, but it still has not done so. The federal government has a responsibility to do a national assessment of drinking water quality. It should establish new safety standards, set priorities for pollution prevention projects, and tell consumers about the full range of pollutants in our water. The policy gaps that hamper source water protection and enforcement of drinking water quality need to be remedied with innovative legislation and regulatory leadership by the EPA in order to protect public health, especially the health of the developing fetus and child. All Americans deserve access to clean and wholesome drinking water. It is essential to dedicate more funding for water infrastructure and source water protection programs and to make it a national priority to safeguard public health. So long as unregulated contaminants remain unregulated and unmonitored the safety and reliability of tap water will remain at risk.